The PL9-DUOR Pixmate from Advance, part of the Da-Lite family of products, is a high-quality mobile monitor or projector stand. The stand is made from a lightweight and durable high-density polyethylene plastic with PVC legs. The included PLE-3 electrical assembly adds 3 electrical outlets to the cart for plugging in equipment. The cart has 4" casters for smooth rolling. 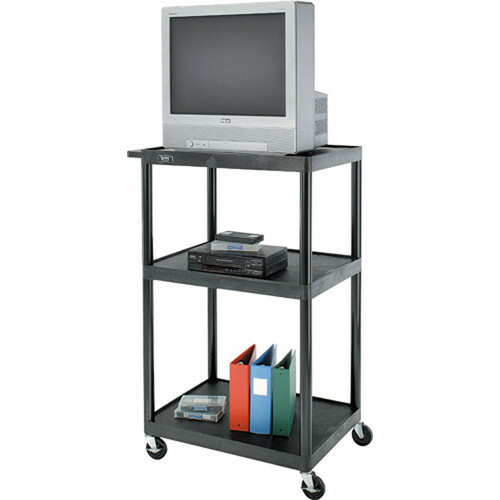 The reinforced top shelf is 24 x 32" and can support TV monitors that are up to 25" diagonal. The lower shelves can be adjusted to accommodate items of varying heights. The stand has a black finish to fit into any decor.